Perhaps no other source for fake fossils has posed such a problem as exists today with fossils from China. We must preface this section to say the fake Chinese fossil market is becoming increasingly sophisticated and changing so rapidly that any fossil now originating in China should be approached with caution. This section deals with only the tip of a massive and growing "iceberg". Each year, thousands of trusting buyers are duped by both inexpensive and very expensive, highly realistic fakes. More troubling, even scientists have fallen prey to the extraordinary craftsmanship of the Chinese fake fossil artists. In 1999, highly recognized scientists along with National Geographic magazine presented an amazing new discovery of a feathered dinosaur discovered in the Liaoning Province of China. 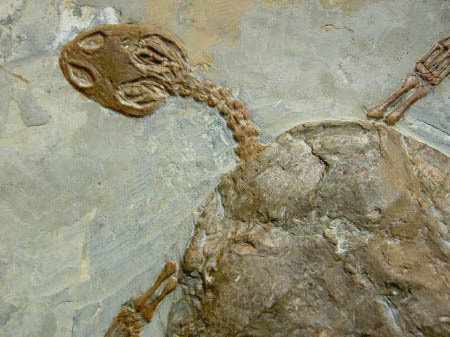 The bird with a dinosaur's tail was named ARCHAEORAPTOR. A year later, it was found to be a clever fake. 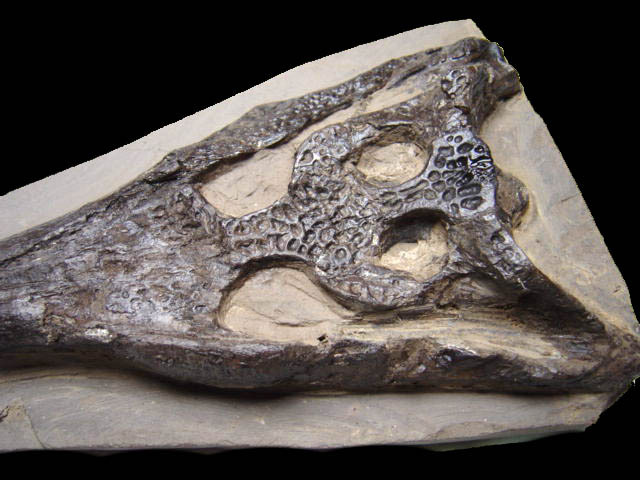 China has an immense scientific wealth of genuine fossil deposits. 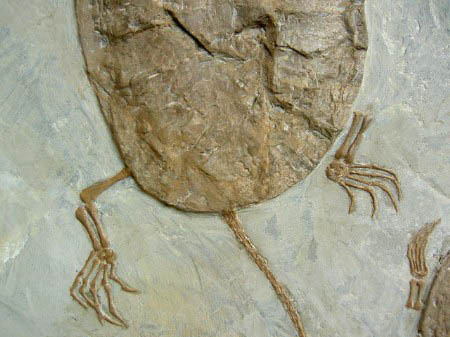 Despite SEVERE Chinese cultural property laws (up to and including the death penalty) that forbid the export or trade in fossils, one can see numerous Chinese fossils for sale in shops, shows, on fossil dealer websites and in online auctions such as EBay (consistently THE highest incidents of fraudulent auctions). With the threat of such strict laws, one has to wonder "How can there be so many Chinese fossils making out of the country?" Simple logic is all that is needed.... THEY ARE FAKES! 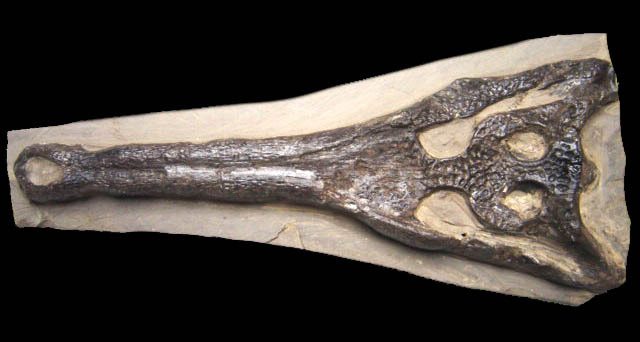 The Chinese have found it easier (and safer) to just MAKE these fossils. There is no worry or risk to a Chinese dealer when they ship a fake out of the country! Most Chinese fossils are found in remote villages where extreme poverty is the norm. The financial rewards to fake or substantially fabricate rare fossils they are familiar with is akin to winning the lottery for most farmers in these regions. With a history and culture of incredible craftsmanship dating back to the Neolithic Age, today, the Chinese have focused their skills on mastering the fabrication of fossils. Each year, countless fake Chinese fossils of ALL kinds are sold to ignorant (and dishonest) fossil dealers who then in turn, sell to trusting customers. Many of these outright fakes have, and continue to, sell for thousands of dollars! The variety and magnitude of fake Chinese fossils that are sold today is endless. Today, the Chinese will fake ANYTHING in their quest to offer something that is new and exciting to the already-flooded fake market. As of this posting, we observed a most interesting creation. There is a dealer on EBay who recently sold a "fossil rat" on a slab fabricated out of nothing more than a horrible fish fossil. The head and body of the fish was altered to look like a rat and the arms and other extremities were carved and painted on the rock. This worthless fake sold for $3,010.00! As the famous quote goes, "There's a sucker born every minute." In this case, the auction involved 8 bidding "suckers" fighting for this one. You can see where the slab on the left side is a darker gray color and ends about where the box is around the fish head. 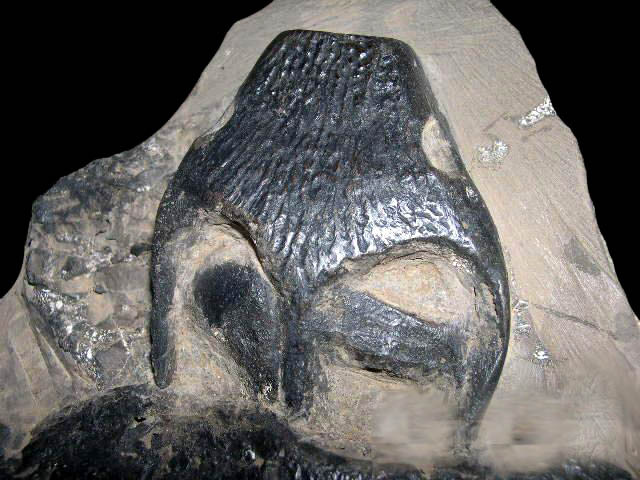 On close-ups of this fossil (posted in the following pages of this section) you can also see unique anatomical characteristics of a fish skull and fish vertebrae with thin spiny ribs that only a fish skeleton would have, not a rat. No doubt this fossil will end up proudly displayed on someone's shelf or worse yet, surface in an auction or be offered by some naieve or crooked seller! There are two main types of "FAKE" fossils coming out of China - those are that complete outright fakes and those that have a portion of real fossil but the majority of the piece is fabricated (sometimes into a fantasy or non-related species). Since both types are worthless, then we use the same term of "FAKE" for both in this article. We have observed expertly done Chinese fossil fakes being sold on both Ebay and a few large fossil dealer websites. Many of these forgeries have sold for THOUSANDS OF DOLLARS with several selling for WELL OVER TEN THOUSAND DOLLARS! Amazingly, many are being sold shortly after being listed! In a February 2000 issue of "New Scientist", an article focused on Chinese fossil fakery (New Scientist, "F is for fake," 19 February 2000). Several highly experienced paleontologists expressed extreme caution about the authenticity of Chinese fossils. Most famous amongst them was internationally known paleontologist Dr. Larry Martin of the University of Kansas. Perhaps his comment offers the most sobering warning to all fossil collectors and prospective buyers of Chinese fossils. Dr. Martin stated "at the moment, I don't trust any of these specimens until I see the X rays!". 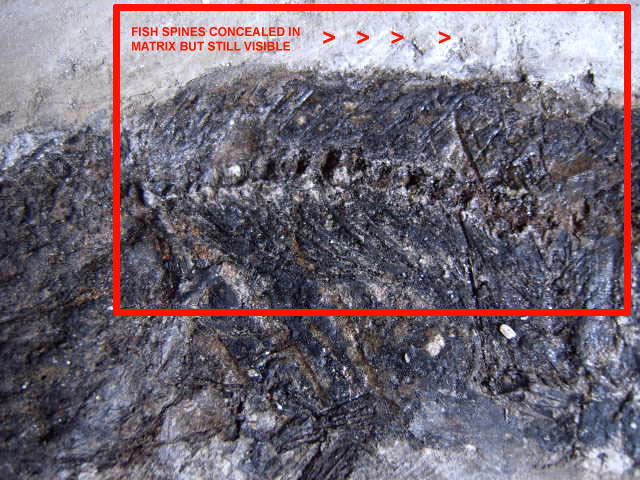 • ANY CHINESE FOSSIL SKELETON POSED ON MATRIX OR LOOSE, SHOULD BE HIGHLY SUSPECT! 1. 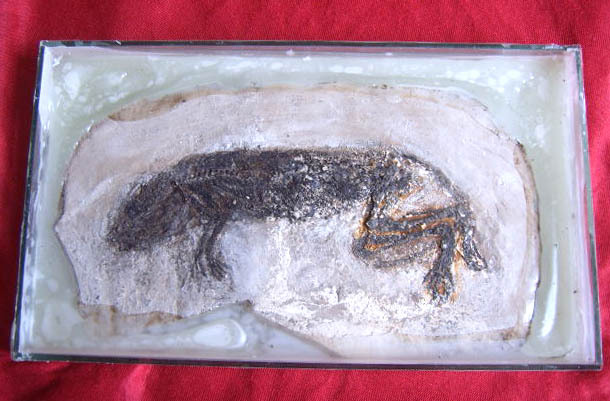 Using real materials (bones, teeth, body parts) to embed in glue, resin and plaster to create a complete fake fossil composite on a slab or piece of matrix. (i.e. 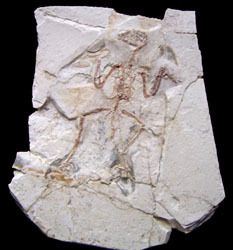 using modern chicken or frog bones glued to matrix to make various skeleton fossils). 2. Crushing genuine fossil bone and mixing with glue to fabricate body parts, skulls and skeletons that appear genuine with the proper color. 3. Casting, painting and sculpting a fossil on a slab or in three-dimension and even breaking it and then repairing it to appear genuine or give the appearance of calcite veins running through the fabrication. 4. Blending three-dimensional skulls (even using modern skulls!) of different animals together with artificially added real teeth to create fake skulls of rare, impressive animals. (especially a problem with Saber Cat skulls) This has been done by adding genuine fossil teeth to modern skulls or attaching animal teeth to a composite of modern skulls such as pig, dog, horse, cat, etc. to create new exotic or rare species. 5. Assembling genuine fossils of unrelated specimens together to make a complete, impressive fossil. The Chinese fossil fakers do this ALL THE TIME! Even the dinosaur eggs are faked by creating a dummy egg-shaped core and gluing on a mosaic of unrelated fossil eggshell pieces that once were part of hundreds of different fossil eggs (sometimes you can still see the varying colors of the unrelated pieces!) together like assembling a picture puzzle, to make what looks like a complete egg! 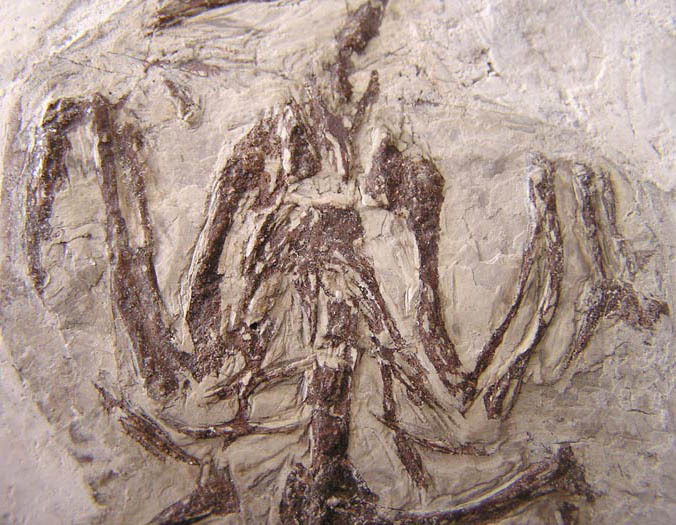 Scientists regard the most notorious of fake fossils to be CHINESE PTEROSAUR and CHINESE BIRD FOSSILS. 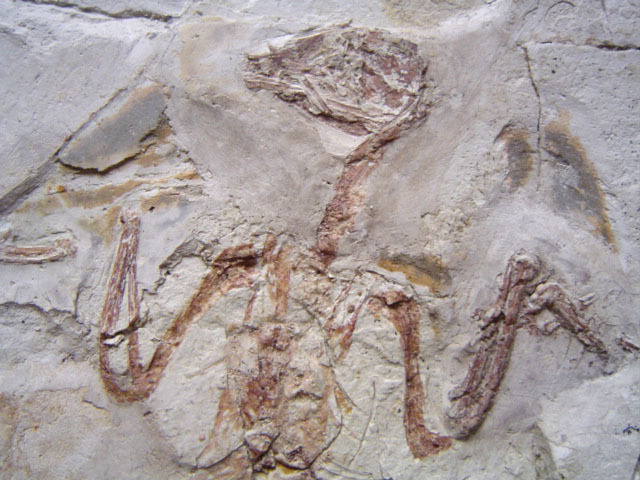 In many cases, there is only a minor amount of real fossil or the specimen is constructed of small amounts of fossil bone from multiple incomplete birds or pterosaurs. Despite some outrageously high price tags, it is this kind of fossil where you can count on problems with fakes and heavily reconstructed specimens - especially if in a "spread-eagle" pose. Nevertheless, these fossils are consistently snatched up by trusting, gullible buyers, many believing these fossils to be genuine simply based on the magnitude of the price alone, or so it seems. 1. Carving, sculpting, painting portions of the fossil that never were there INCLUDING SOFT TISSUE AND FEATHER IMPRESSIONS!!! 2. Assembling several components of fossil bones from several different incomplete animals into one animal. 3. Utilizing modern bird (or other type) bones arranged and embedded on a matrix slab or artificial matrix rock. 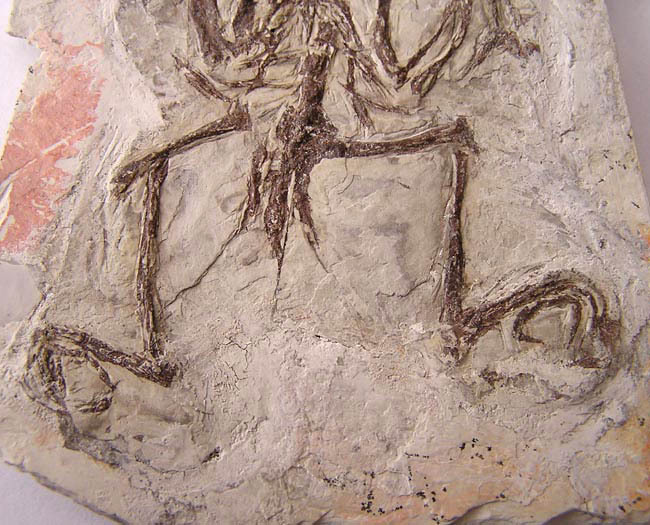 The most obvious indicator of a Chinese bird or pterosaur fossil fraud is the "too good to be true" pose with the wings and legs held out from the body. 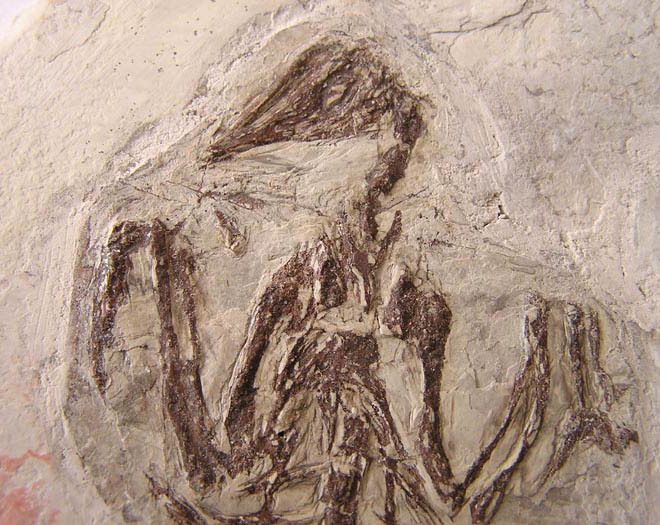 GENUINE bird and pterosaur fossils are amongst the rarest since the bones are hollow and extremely fragile. 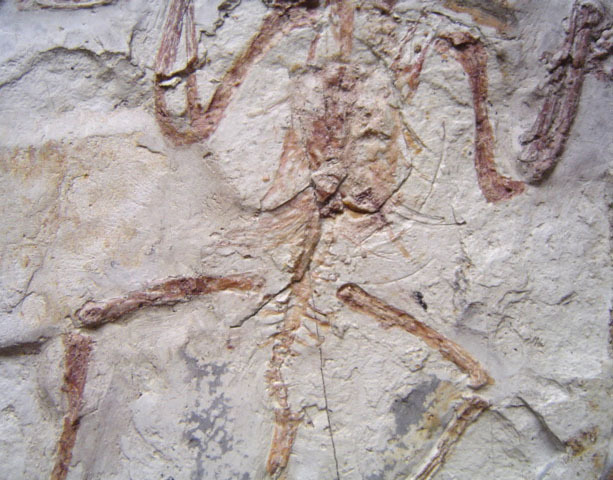 Pterosaurs and birds were/are frail and delicate animals. When subjected to the forces of burial, just what kind of odds do you think such a creature would be preserved in such a perfect pose? A little COMMON SENSE is all that is needed to rule out that so many of these "picture-perfect" bird and pterosaur fossils from China are fake based on the pose alone! 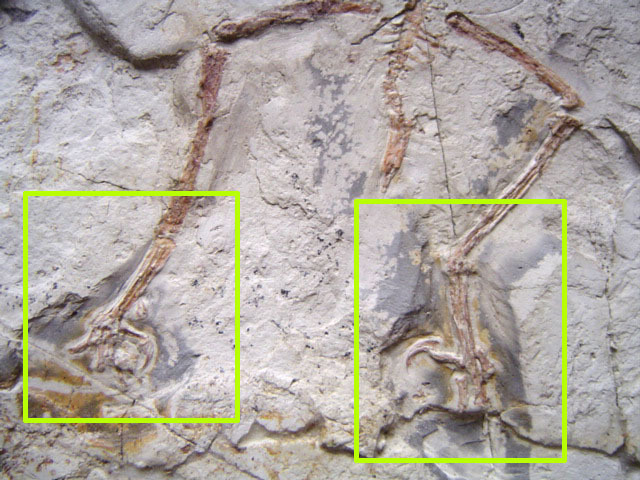 In most authentic specimens, the animal is found badly twisted when buried and complete, articulated fossils of these two types of creatures are EXTREMELY RARE. As mentioned earlier, a February 2000 issue of "New Scientist" featured an article focused on Chinese fossil fakery (New Scientist, "F is for fake," 19 February 2000). The underlying message is that the sophistication of the fakery being done by the Chinese is good enough to fool scientific professionals. 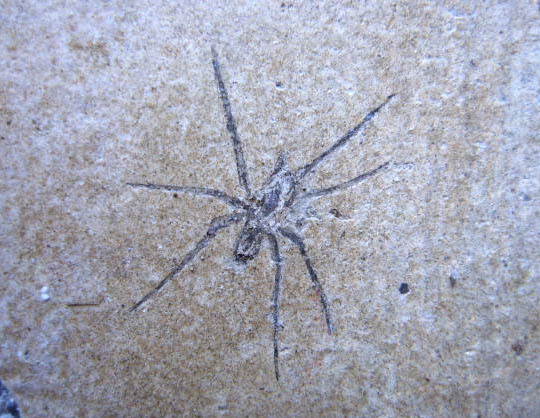 Dr. Luis Chiappe of the Natural History Museum of Los Angeles County recalls one specimen that aroused his suspicions. "I wasn't sure what was wrong with it but measurements showed that one leg was longer than the other." Only when he started preparing it did he find there was mortar that had glued two slabs together. "On the surface you really couldn't see that," says Chiappe. Internationally famous paleontologist Dr. Larry Martin of the University of Kansas offers the most sobering warning to all fossil collectors and prospective buyers of Chinese fossils. Dr. Martin stated "at the moment, I don't trust any of these specimens until I see the X rays". Head region is plastered and painted - completely fake. Very small amounts of real fossil have been incorporated into this worthless composite "fossil" with carved and painted "bones" to complete the skeleton. 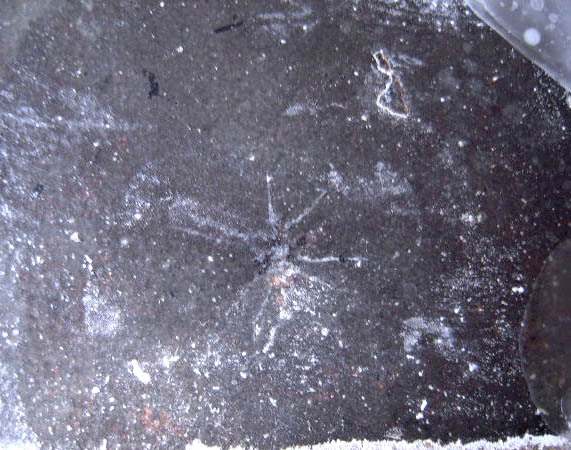 Slab is patched together from genuine matrix scraps from the actual site where these fossils can be found. Feet and claws carved in the rock and then stained. 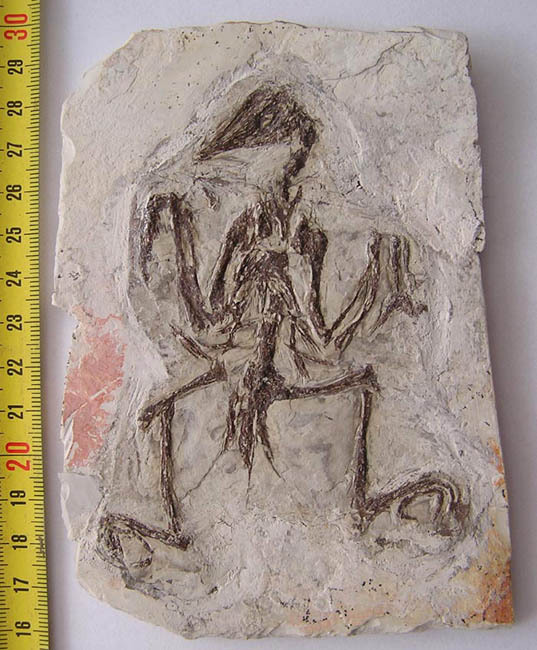 Another FAKE Chinese bird fossil sold as genuine. Does the pose look familiar??? Look closely at the "bone". Smooth, anatomically accurate detail is lacking. Size, symmetry and anatomy different of what should be identical left and right appendages. A fake composite SABER CAT SKULL made from a substantially modified dog skull but possibly a mix of multiple animals. Entire snout portion is roughly carved plaster with fake saber teeth and genuine carnassial teeth glued into the jaws after the original genuine teeth were removed. 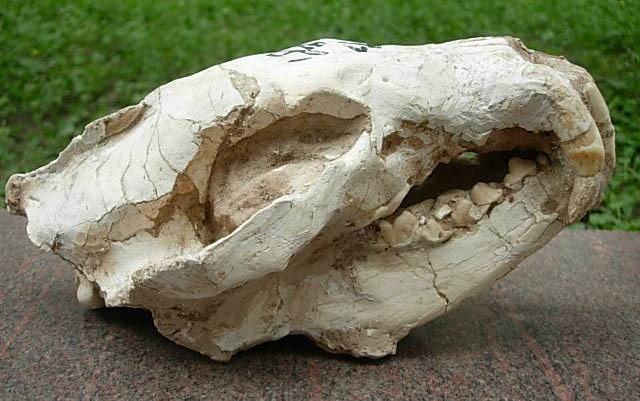 It is not uncommon to see various impressive-looking mammal skulls from China where one skull is made up of multiple animals with real components of horse, pig, wolf, hyena, and cat fossils. 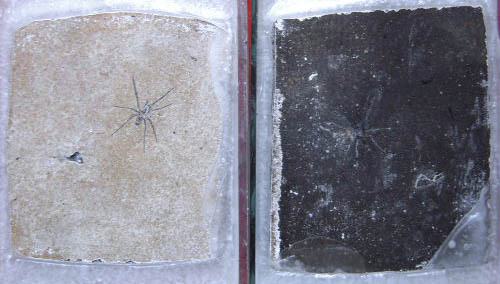 A entirely FAKE Chinese spider fossil with a fabricated negative slab included to appear authentic. Note the fake negative impression legs and angles do not exactly match the fake positive painted impression. These were very popular for a while and still can be found fooling people after all these years. There is no real fossil bone here, just an epoxy putty (like Bondo) creation attached and made on a genuine blank matrix rock slab. In the photo below, you can see the sloppy work where some voids and bubbles exist amongst the carving of the "bone". Also, the tan color of the Bondo matrix in the skull openings is a different color than the gray stone base it is on. The matrix in these two areas would be the SAME color if this was genuine. After this was sculpted and carved, it was painted. This FAKE was sold as being 100% authentic and guaranteed. Regardless, the unsuspecting buyer is unaware that they now proudly showcase a total fake in their collection! The Chinese sure have fossil formations full of very artistic fossils! Actually, this "cute" double frog fossil is a total FAKE - carved in the rock, stained and then sealed with glue to blend and disguise the work. Many times Chinese fakers will make multiple fossils in "friend / lover" or "mother and baby" themes in order to appeal to the ignorant buyers looking for "pretty" items. All of these forgeries sold for very high sums of money! Genuine specimens of these are RARELY so artistically and perfectly posed together in nature. 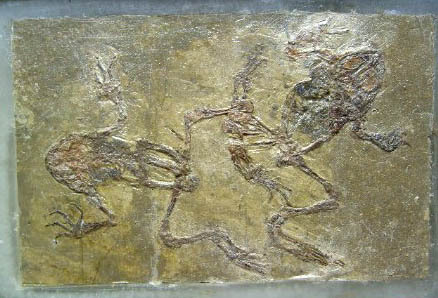 Both creatures are painted on a blank rock slab lacking any real fossils. Meant to appeal to those that want artful-looking fossils. Another FAKE "companion" double fossil with an artistic theme. 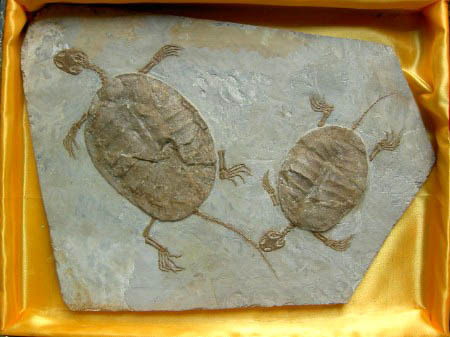 BOTH turtles have been carved on a rock slab and then stained and sealed to appear genuine. Very limited portions of the carapaces appear genuine but at best, they contain less than 50% authentic material with the skeleton and double position being TOTAL forgeries. Note anatomical inaccuracies as well as asymmetry in skull openings, bone shapes / sizes. Color of bones is also very artificial-looking and differs from the resin and glue carapace. EVERY one of these you see for sale will be FAKE or mostly FAKE with few to no genuine fossil components. 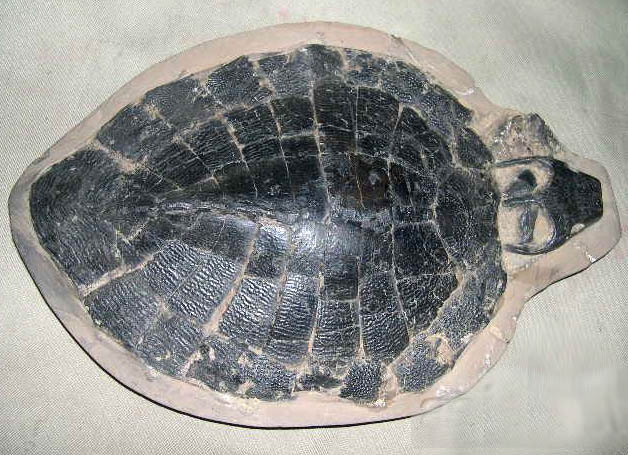 Below is a common turtle fake fossil from China that has been around the market for quite some time. The technique to make these utilizes epoxy putty similar to auto body filler. The animal is sculpted, textured and carved before the putty cures, and then painted and sealed. The same process to make these is also used on the CROCODILE SKULLS shown at the top of this page. The pink tone you see in these "fossils" is not genuine matrix but the color of Bondo auto body epoxy putty. The gray region on the edge of the rear is where the putty was sanded down too far, went beyond the pink Bondo putty layer and ran into the gray color rock base. Note the photo below of the skull which lacks the proper shape, texture and definition of genuine bone. Like the crocodile skulls from China, this turtle is a FAKE. This example of Chinese fossil fakery powerfully demonstrates the skill and creativity of the Chinese artists. 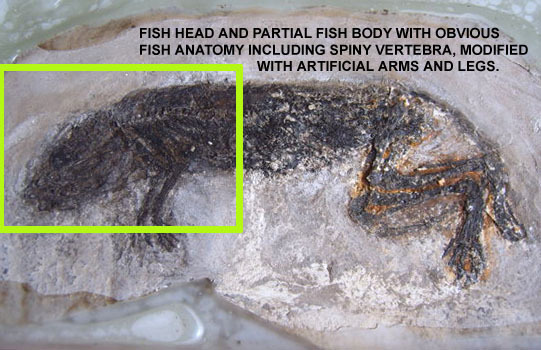 Featured here is a "RAT FOSSIL" that was made from a worthless FISH FOSSIL! The anatomy of the fish is very obvious yet to a trusting buyer, may go unnoticed. 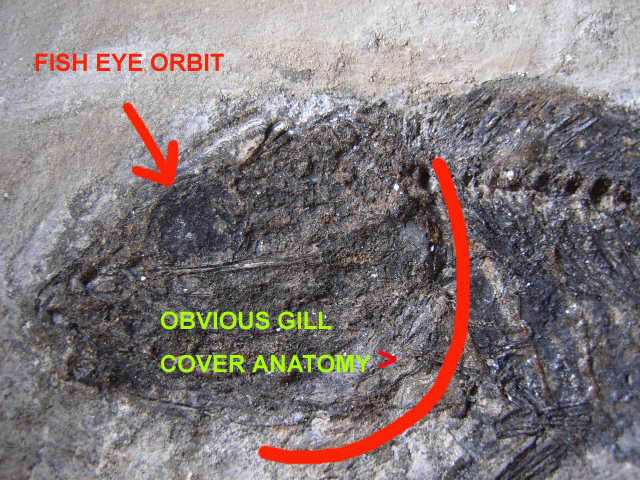 In the following photos, we see an obvious fish skull with large round eye orbits (rat skulls do not have eye orbits). We also observe in the second photo below, an obvious operculum (fish gill cover) as well as close-ups of the long spines of the fish vertebrae. 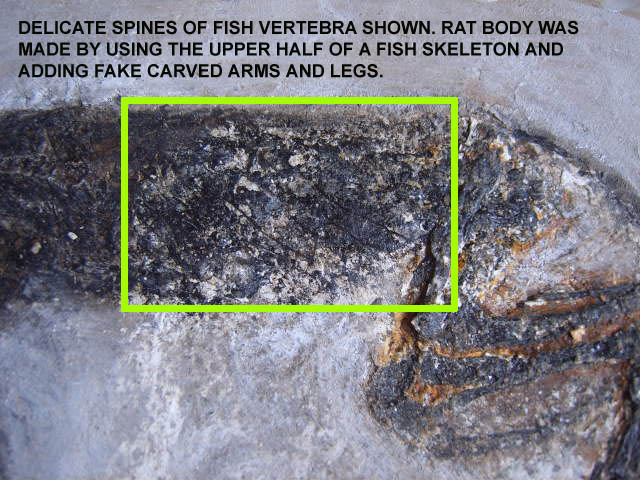 This FAKE RAT FOSSIL was created by using the head and partial body of a fish fossil. The upper portion of the fish skeleton was plastered over to give the spine the appearance of having a rib cage of a mammal. Arms and legs were then carved and painted on the rock. Clever yet, worthless. It was sold to some unfortunate bidder on EBay for $3,010.00 after numerous bidders battled it out. 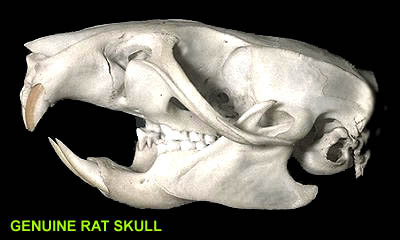 The photo above shows what a genuine rat skull looks like. Compare this to the fish head above. Rodent skulls do not possess eye orbits in the bone and certainly do not have gill covers! The second photo below shows a "rib cage" that runs all the way to the hips which is not correct in a real rat skeleton which has the rib cage ending before half-way down the spine. 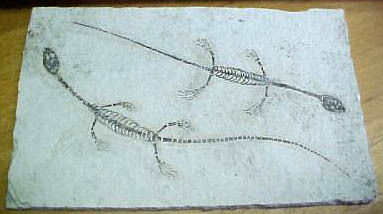 The long spines shown near the hips are simply a continuation of the fish vertebrae spines.